If you are looking for a light, tasty & inexpensive filling for some summer ravioli, one Abruzzo classic stuffing is walnut & ricotta that will not just bring a wide smile to any vegetarians that you are having for dinner, but anyone (namely the world!) with a fixation for these plump little pillows. Mix all ingredients for the filling and let it rest in refrigerator for a few hours (it makes it easier to work with). Ideally on a cold worksurface, make a volcano crater shape with your flour, add each egg into the crater wih a very small pinch of salt and work in work into the flour. Once you have a dough, begin to knead it, until it is feels elastic and maleable. Cover & leave to rest for 30 mins at room temperature covered. Lightly dust your worksurface and roll out your pasta dough until thin, approximately 1/8 inch (1/3 cm) thick and cut with either a cookie cutter or use a large glass to cut-out your ravioli shapes. 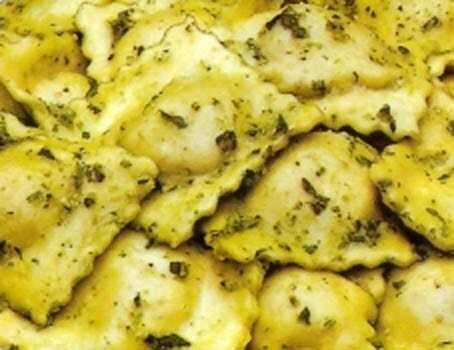 Take your bowl of filling out the fridge and scoop up 1 tablespoon of filling per raviolo. Add the tablespoon into the middle of the pasta cut-out. Moisten the outside of the pasta cut-out with water and fold in half, pressing the outer edges together to help seal each raviolo. Using the top of a fork press down on the outer lip of the raviolo to help seal & add a little decoration. Sprinkle a little flour over each raw raviolo to stop them sticking together whilst waiting to be cooked. Bring to the boil a large pan of salted water. Dust off the excess flour from your pasta and place in the boiling water. When each raviolo floats to the surface it means that they are done – approximately 5 minutes. Once cooked, drain and place on a platter and season with a combination of butter, finely chopped sage and a sprinkling of pecorino cheese. Wow fantastic Dino, so glad they were enjoyed, it's a great recipe and hope lots of diners enjoy them in the future too.